Foolishly believing that, at last, this really was England’s best ever chance to win the World Cup, Paul Hewitt sets forth to Germany in his Bongo. This is his tale. We set off for Dover from Poole on Thursday 22nd June at lunchtime. Negotiated M25 and M20 quite comfortably but not a certain well known burger outlet at a Motorway service station a few miles before Dover. I cracked a tooth badly on a burger. With an hour to go to ferry there was nothing else for it but to take the evening ferry to Dunquerque with Norfolk Line (£24 single – great value) and hope to visit a German dentist on the following Monday. So for the next 3 days I survived on a diet of mushy foods, paracetamols and pure German lager. We stopped Thursday night in Dunquerque and the next day struck out for our pre-booked campsite at Bad Liebenzell, 40kms west of Stuttgart, in south west Germany. Driving through north east France, Belgium, Luxembourg and into Germany we only hit really bad traffic 1 hr away from Stuttgart after an unfortunate wrong turning. We blame the German road signs not having road numbers, only destination names (big cities such as Munich, Stuttgart, Karlsruhe and the like). So this wasn’t really very helpful to us in finding the right route to our small sylvan hamlet in the Black Forest. And the Germans love to confuse us almost as much as the French by giving roads more than one alpha numeric title. Our wrong turning took us along a 3 lane motorway which was down to one lane for many kilometres due to major roadworks. Talk about bad timing and planning. With so many World Cup football fans of many nations driving in, around and through Germany it dispelled the German organisation and efficiency myth. We made our campsite after dark, grabbed a beer and went to bed after a long day. Within half an hour we were disturbed by someone at the back of the Bongo banging on our rear door at midnight. I summoned up as much courage as possible and confronted a drunken scouser who when asked what he was doing replied he didn’t have a clue as he was “out of his head”… I pointed him in the direction of the path and he staggered on his way. We found his sunglasses the next morning but couldn’t find him. Pleased to say, that was the only slightly fearful moment we have had with other English fans in all the 5 tournaments we have attended. The campsite was tops, nestled in a small wooded valley on the edge of a pretty town and would thoroughly recommend it. There was a large beautifully maintained outdoor swimming pool next door which was very welcome in the 30degC temperatures. But it cooled down in the forest at night so good night’s kip was never a problem. On Sunday 25th we went to the Stuttgart Fans Park to view the England v Ecuador game on 2 big screens. There were 79,852 England fans, 146 Ecuadorian fans and 2 Australians. There was no trouble (that we saw) and the whole thing went off very well – except the football which was pretty dull to be honest. The nice German dentist hacked half my tooth away the next morning and although we had our E11’s with us, didn’t want any money at all! I could now tuck into some decent German sausage. The rest of our 6 day stay at Bad Liebenzell was idyllic. One day we drove for an hour through beautiful wooded hills and mountains west to Baden-Baden where the England squad were based. It is a spa town and very pretty. Baden-Baden (so good they named it twice) was where the glorious England squad and their wags (Wives And Girlfriends) stayed. And lo and behold I came across this well known footballer of the dirty tackle leaving a house of ill-repute, just like last year in Liverpool. He prefers more mature pleasures, I understand. Doesn’t Colleen look fabulous without her make up? 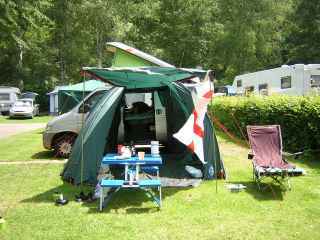 With England facing Portugal in the quarter finals the following Saturday in Gelsenkirchen (near Dortmund and Dusseldorf), we drove north.We found a strange little campsite in a town some 40kms from the venue. It was full of permanent pitches with permanent old caravans in situ. Some had a paraphernalia of garden gnomes, others small gardens full of beautiful flora whilst others were pretty grim. That part of Germany (North Rhine Westphalia) is known more for being the former industrial (but now commercial) heartland of Germany, rather than a place of natural beauty. It is rather flat and uninspiring but for 2 nights, we didn’t mind. The Gelsenkirchen authorities did the fans proud by having 2 fan parks – one dedicated to England fans with BBC beamed coverage on the 2 large screens. After our inevitable loss to Portugal on penalties we made our way home, stopping off at Eindhoven overnight. The next morning, 2 hours drive took us to Calais and homeward bound. All told, our Bongo, did us proud. Not a single problem. The overdue 15,000 km service a week before the trip probably helped! Now we are planning Euro 2008 – Austria here we come …. anyone know any good campsites over there?